The holidays in Louisiana feature a stunning array of festivities and events. Good food, music, and camaraderie abound. 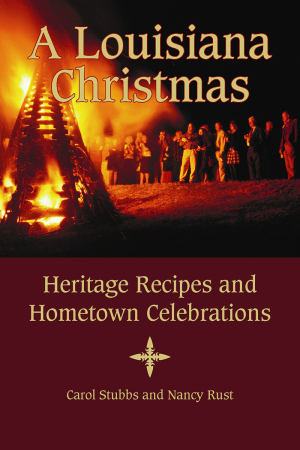 This volume takes readers on a statewide tour of les fêtes de Noël and provides recipes and activities for the whole family. From the lighting of the bonfire at Oak Alley Plantation to Natchitoches’s Festival of Lights, experience the living culture that the Pelican State has to offer. After a tour of the local entertainment, gather up friends and family and enjoy some of the delicious appetizers, sweet and savory breads, entrées, and desserts included in this beautifully photographed collection. Separated into geographical sections, this book takes readers on a tour of traditions and happenings in Cajun Country, Sportsman’s Paradise, the Crossroads, Plantation Country, and Greater New Orleans. Contact information is included, along with a description of each festivity. Featured are photographs of the exquisite Hanley-Gueno Neapolitan Presepio Nativity figures, crafted in the eighteenth century. More than one hundred fifty recipes cover every course for every get-together. Family-friendly crafts and activities will keep adults and children celebrating the season all winter long. Carol Stubbs, a freelance writer for more than thirty years, earned her bachelor’s degree in journalism from Louisiana State University and her master’s in education from the University of Louisiana at Lafayette. She was an editor of Acadiana LifeStyle for three years and was the longtime editor of a bi-annual bridal guide. A former teacher, Stubbs regularly contributes to local publications and tourism guides. Nancy Rust taught reading for twenty-five years in Kentucky, Florida, Louisiana, and Arizona. She received her bachelor’s degree in English from Western Kentucky University and her master’s and specialist degrees in education from Louisiana State University. Rust has written several children’s books, is an accomplished poet, and has had fiction published in the Jubilee Anthology. Stubbs and Rust are members of the Writers’ Guild of Acadiana, Friends of the Library, Friends of the Humanities, and the Society of Children’s Book Writers and Illustrators and are active volunteers and teachers through Volunteer Instructors Teaching Adults. They both live near Lafayette, Louisiana, with their families.